I've spent the last couple days baking cheesecakes. An absurd number of cheesecakes. I'm on a mission to fatten up Mr. Humble (If you're reading this go have another slice!). Hopefully time allows me to actually get some posts up and I can share at least a couple. So I'm starting to feel the holidays approaching and I decided to put down the summer berries and accept that fall is upon us and that I should start making some seasonally appropriate dishes. Although really, we only have two seasons in Seattle: the wet season and the not as wet season. Anyway, my first seasonal recipe is relating to pumpkin. I know there are plenty of pumpkin breads, ice creams, whoopee pies, muffins, soups and of course, cheesecakes all over the place out there in the foodie blogosphere. Still, I baked a pumpkin cheesecake and I'm going to post it... just like everyone else. However, this isn't your run of the mill pumpkin cheesecake, this one is just a little different. 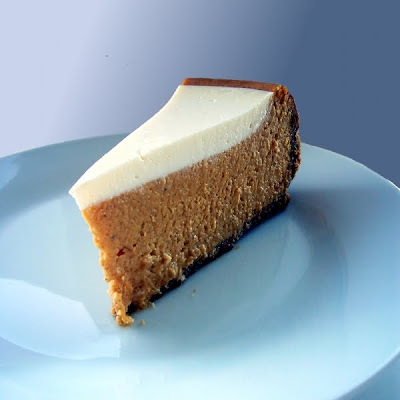 Pumpkin with a hint of hazelnut in both the cheesecake and topping, in the form of frangelico. Lots of frangelico. So try not to drain the bottle whilst assembling the thing, even to steel your nerves against possible cracks. You're going to need that stuff. I like to use whatever cookies I've been baking recently to make my cheesecake crusts, be it gingersnaps, homemade graham crackers, or in this case, those vanilla bean cookies. Whatever I have on hand that is getting just a little too stale to eat and will make a good crumb. You're welcome to use whatever you'd like to create the crust here, just aim for about 2 1/2 cups of crumbs and 3-5 tablespoons of melted butter (depending on how moist the crumb is) and it should work fine. You may also add toasted chopped hazelnuts to this crust as well if you would like to incorporate the hazelnut flavor there too. For my vanilla bean cookie crust, I re-baked 5-6 cookies in the oven for 30 minutes at 200 degrees to remove any remaining moisture and allowed them to fully cool. I then ground them in the food processor to obtain my 2 1/2 cups of cookie crumbs. I mixed these with about 3 tablespoons of butter to form the crust. Press the crust into a buttered 10 inch spring form pan outfitted with a round of parchment. Bake at 350°F for 10-12 minutes and allow to cool on a wire rack. Leave the oven on but reduce the heat to 300°F. Place a dish of water on one of the oven racks, leaving the lower middle rack free for the cheesecake. This will up the humidity in your oven and keep the heat gentle. After all your ingredients have reached room temperature fit your stand mixer with the paddle attachment and beat the cream cheese on medium speed for several minutes till smooth and lump free. Slowly incorporate the granulated sugar and then add the brown sugar. Add the spices, vanilla and frangelico to the mixture and mix till uniform, scraping down the bowl occasionally. Sift in the flour and add the pumpkin puree and mix on medium speed. Reduce the mixer speed to low and add the eggs one at a time, allowing each to be incorporated before adding the next. I then strain this batter through a loosely woven mesh sieve because I like to ensure it is homogenous. This removes any little rogue particles of brown sugar, egg chalaza or cream cheese bits that were not beat into submission during the batter making. Pour the filling into the crust and place in the center rack of your oven and bake for 65-75 minutes at 300°F. At an hour check the cheese cake; it should be set but still wobbly in the center (any testing of 'wobbliness' should be done as gently as possible). Turn the oven off and prop open the door a few inches. Let the cheesecake sit in the oven for another hour like this. Then remove from the oven and place on a wire rack . Turn the oven back on and preheat it to 400°F. Mix the ingredients for the frangelico topping until smooth. pour onto the cheesecake and return to the oven for 7-10 minutes till the topping sets. Remove from the oven and allow to cool in the pan. I slide a small offset spatula around the edge of the cake now to loosen the cake from the sides of the pan so it can contract freely, helping to prevent cracking. Allow the cheesecake to fully cool then chill in the refrigerator for at least 6 hours or overnight. Cut with a clean wet knife. Your cheesecake looks so professional & perfect! I like how the white topping looks - very smooth, white & creamy. Everytime I make cheesecake, it looks cracked or the crust looks weird or patchy or uneven or something to mess up the looks. The appearance of yours is what I strive for! I will come out and admit I had a small crack in this one, despite my best efforts. However, that is what the topping is for, isn't it? Extra flavor and masking those annoying little imperfections? For the top, I try to get the freshest, thickest brand of sour cream I can find. This works the best to give me a thick, smooth mixture to level the top and hide any flaws. Wow it's beautiful. I like the layers. Anyway, I made this cheesecake for my family's Christmas lunch (despite the fact that it's the middle of summer here in NZ and pumpkins aren't in season...). And... it was amazing. You are officially my new favourite recipe provider. You even beat Nigella. Next I've gotta try some of your fudge recipes, because a friend of mine from the US sent me a jar of Marshmallow cream and it arrived today - we can't get that stuff here!